I’m aware it’s still technically still winter but since that warm week we had in February and feeling that warm sun I’ve been all about lemon and fresh flavors more than usual. I’ve been on a citrus kick all winter and love pairing it with avocado in fresh salads but other meals have been a lot of roasted root veggies, sweet potatoes, and more comfort food winter dishes. Snack and protein bites I’ve made have been mostly sweet and salty like my Peanut Butter Pretzel Snack Bites. Switching it up a little I made some Lemon, Hold The Poppy Give Me Chia, Protein Cake Bites. 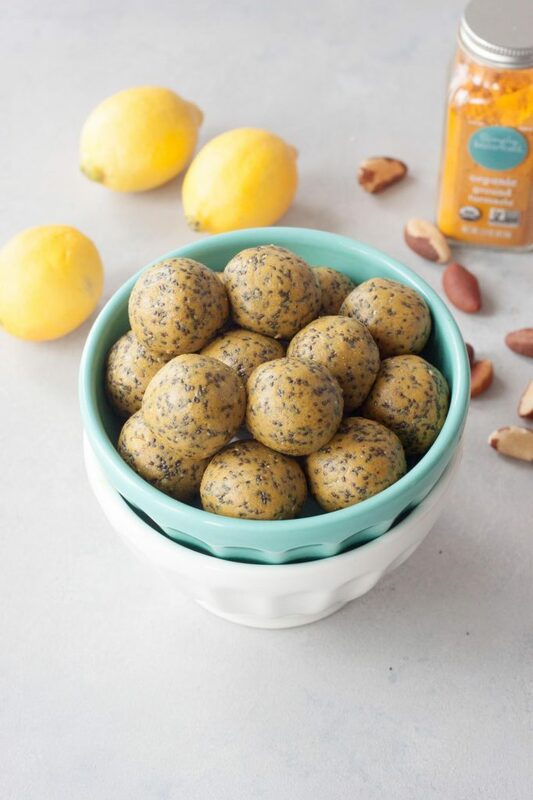 Or Lemon Chia Protein Cake Bites for short. Despite the name and taste these are healthy little bites. The sunshine color, turmeric, yes more turmeric because I can’t get enough and it reminds me of sunny sunshine! Warm sunshine I hope to be soaking up a lot of in just over a week in California at Expo West and then vacation. Besides lemon and turmeric I’ve also been eating more Brazil nuts again lately. I started eating more of them over a year ago as they’re good for thyroid health but I haven’t been eating them as much for some reason so I also use those instead of cashews. Chia well we were on such a kick and stopped for awhile but back at eating cha-cha-chia all the time, and great boost of omegas! To not overpower the lemon I also went with coconut flour and coconut, well and I just like coconut. So healthy, filling, oh and I decided to add in a little protein and healthy fats. What’s not to love? 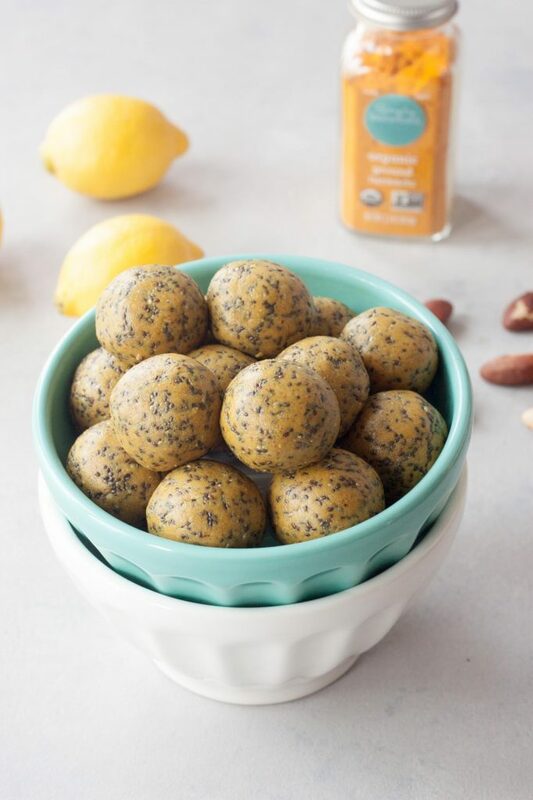 Well testing Lemon Chia Turmeric Protein Bites and I decided to have my oldest daughter try them and let’s just say she flipped! She was in love and thought they tasted like lemon pound cake! Not going to lie I was going for a light cakey flavor and texture (I always think my protein powder tastes like angel food cake) but when I added in the chia seeds I thought that was gone but wanted to keep them because in the process got to thinking about lemon poppy seed muffins. Which I can’t even remember the last time I had one. I just really wanted to up the nutritional benefits, even though I changed the name after her reaction and added her suggestion of cake. So what these balls are packing besides “lemon pound cake flavor”, nutrition! Brazil nuts contain magnesium which helps with the functioning of muscles, the production of protein and absorption of energy from food. They are also said to promote thyroid function as well as support bone and teeth health. Chia Seeds are loaded with omega fats, protein, antioxidants and fiber. They are a great source of healthy essential fatty acids, eight times more than salmon! They’re also one of the most digestible plant proteins. Protein I like to use Vega which is a plant-protein (vegan, dairy free, soy free, gluten free) which is packed with additional benefits but mostly protein and turmeric for post workout recovery to fuel my muscles and reduce inflammation. Although I wouldn’t just have these post workout as there isn’t a lot of protein and I didn’t include pepper which helps the body absorb turmeric. It really can’t hurt but in this recipe it was more for color than the nutrition. Coconut and coconut oil for healthy fats and MCTs. A little nut butter for more protein, and I sweeten these little bites with honey, maple syrup, or agave. I tend to go with honey in these. Oh and for flavor no extract just lemon zest! 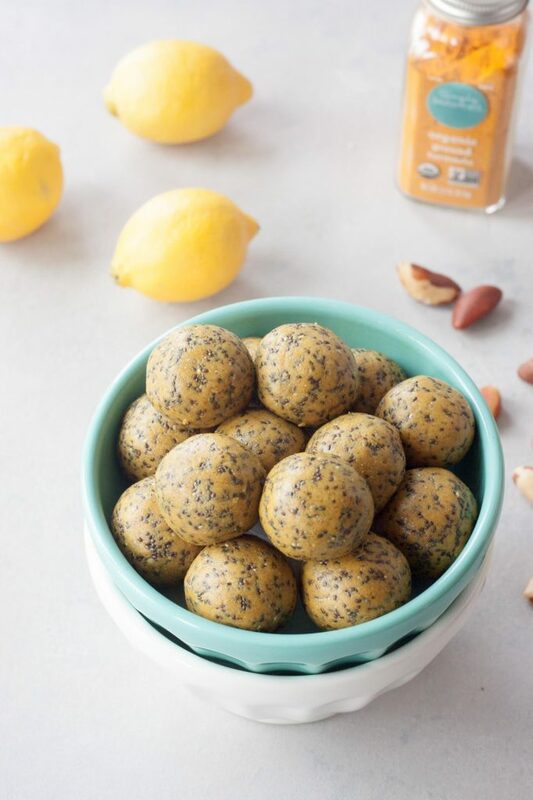 So these Lemon Chia Protein Cake Bites make a perfect little sweet treat! Grab a couple to get through that afternoon slump or to enjoy with a matcha latte or grab a couple post barre or yoga for a healthy refreshing treat. Pulse Brazil nuts in a food processor until they are all broken up and you have a course crumble. Add in coconut flour, protein powder, coconut, chia seeds, and turmeric powder and blend until you have a course flour to flour texture. Add lemon zest and pulse just to incorporate it. In a bowl mix together nut butter, sweetener, and coconut oil until smooth. Pour the wet mixture into your food processor and blend until the mixture comes together, scraping as needed. The mixture will be a little wet but you should be able to form into balls. Form into small balls and then roll lightly. Place on a plate and once all your bites are made place in the refrigerator or freezer for 30 minutes to set or until ready to enjoy. Store in an airtight container in the refrigerator, or freezer for longer storage, until ready to enjoy. These are best enjoyed straight from the refrigerator or within 10 minutes as they get soft. Enjoy! Yum! I love lemon flavored eats! This reminds me of lemon poppyseed (a fav of mine) and also that I need to get more poppyseeds. I do like you power addition of chia seeds though! Thank you! I can’t remember the last time I had a lemon poppy seed muffin but I’ve now been working on a lemon chia seed one. Might have to have the original to compare. There are so many ways to enjoy chia, I hope you try it soon! These bites are perfect for my afternoon slump like you mentioned! I don’t do a ton of fish so anytime I can get in chia seeds with Omegas I’m all about it! I also love lemon recipes in the Spring! They are so refreshing! They really are a perfect afternoon pick me up and great source of omegas! Can it be any nut? Or does it have to be brazil nuts? I would suggest using cashews or if you don’t have those almonds as to not overpower the lemon and keep it fresh. I haven’t tried it yet but I can’t see why they wouldn’t work. Great – I was thinking cashews 🙂 can’t wait to give it a go. How could you not love these?! Such the perfect little bite of bright flavors. Just in time for spring! My thoughts, what’s not to love? Thank you Jessica! I finally figured out how to get my balls to stay together, so now I need to shake things up a bit and try this! i have some chia just waiting to be used! I’m usually a chocolate girl but definitely have a weakness for lemon-flavored treats! Especially healthy snacks that taste like pound cake! YUM! Love everything about these bites! These are my kind of snacking! I honestly can’t believe how smooth and perfect those look! Such a fun healthy blend too. Alisa Fleming recently posted…Vega Protein+ Shakes: Ready-to-Drink & Dairy-Free! PINNING these to ‘Recipes to try soon.’ I LOVE lemon cake, and these sound just perfect. I had no idea brazil nuts were good for thyroid heath (something I REALLY need to focus on since I’m convinced mine is all jacked up since having my second). OMG these look sooooo good. Undoubtably will have zero will power to stop at just 1 or 2!!! I didn’t realize brazil nuts are good for thyroid health – that’s good to no (since I have no thyroid at all!). I keep reading of all of the things I should avoid for thyroid health, it’s nice to come across something I should include that I didn’t already know about. Made these today with almonds subbed in for the Brazil nuts. They’re tasty. My mixture didn’t stay together as outlined in your recipe so I had to use the juice from my lemon to add enough moisture to get it to stick together. Then they were great! Hmm. You added all the other ingredients listed? My only other thoughts are if you used a different protein powder, if your coconut flour was packed/settled (some people will put their measuring cup in the jar and scoop it out and it ends up packing it if that makes sense) or if your almond butter was drier. Mine are always far from dry, sometimes a little on the wet side, so I didn’t add a note to adjust for that. Sometimes if it’s just perfect I will add a note about adding more wet or dry ingredients to get the consistency needed. Happy they turned out and you enjoyed them but would like to try to figure out why they were dry. I made these last weekend for my Sunday morning group, who absolutely loved them and kept coming back for more. They were quickly gobbled up! I just made another batch to take to this Sunday’s morning group. Like Karissa, I also added lemon juice but not because the batter was dry – I just like lemon and thought a little more lemony taste could only be good. Thanks for a winner!